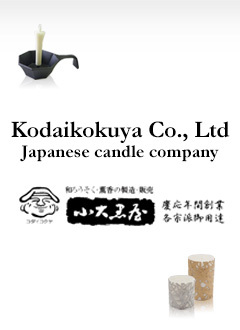 Kodaikokuya began making and selling incense and traditional Japanese candles made from Japan wax in the Keio era at the end of the Edo period and has continued doing so now for six generations spanning more than 140 years. 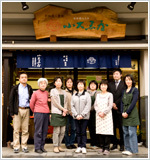 Currently located on Gofukumachi Street in Fukui City, Kodaikokuya makes use of techniques and traditions that have been passed down since the time of its establishment, earning it the support and patronage of many, including the prestigious Eihei-ji, one of the main temples of the Soto school of Zen, as well as many other temples. During Japan’s economic boom following the end of WWII, traditional Japanese candle culture nearly faded away. There was a period when domestic Japan wax grew difficult to obtain and fewer people were willing to carry on the wax-making trade, leading to a shortage of both materials and artisans. During this time, many Japanese candle makers gave up on the craft and moved on to other types of business. 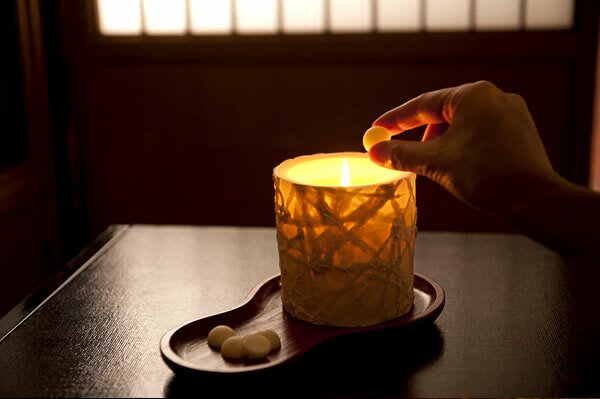 Of course Kodaikokuya also struggled due to the shortage of Japan wax, but we continued to research and experiment with production using whatever materials were available, driven by a strong desire to protect and nurture the tradition of Japanese candle making. 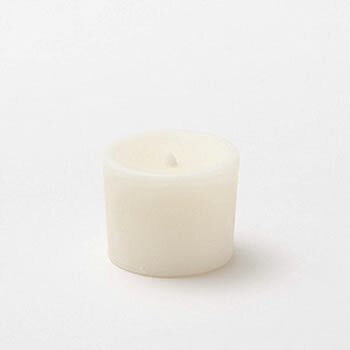 After much trial and error, Kodaikokuya succeeded in producing a wax that is domestically refined using imported vegetable oils and we continue to use that wax in our Japanese candle making process today. In recent years, domestic Japan wax has once again become more widely available and Kodaikokuya produces and sells this wax as well. By continuing to make and sell incense and Japanese candles, we hope to nurture the culture and traditions of fragrance and light and to pass them on to the coming generations. Japanese candles are created using one of two methods. 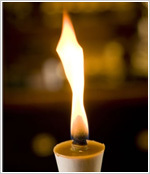 In the first method, known as tegake, the wick is hand-coated with wax layer by layer until the candle is completed. This method gradually began to disappear sometime around the Meiji period. 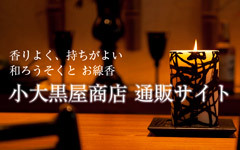 The other method is known as katagake, and consists of pouring wax into a wooden mold that holds the wick. Artisans that can craft these wooden molds have become scarce, and the wooden material best suited to create the molds is also growing harder and harder to find. 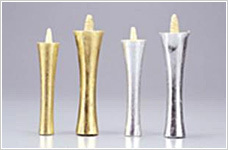 As a result, the number of Japanese candle makers using metal molds is increasing. 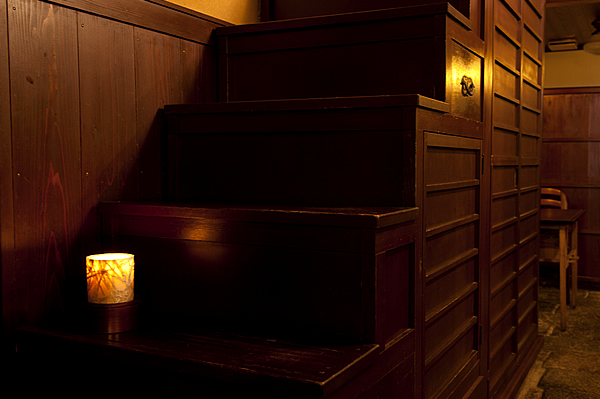 At Kodaikokuya, our wooden molds are crafted in-house. This allows us to manufacture all of our candles via the katagake method using only wooden molds, and we are working to pass this tradition on to coming generations as well. 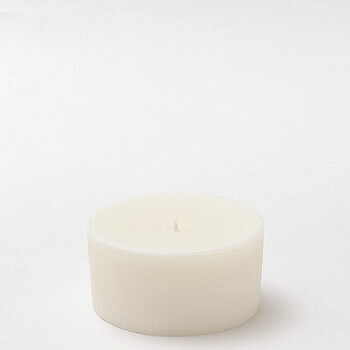 Kodaikokuya Japanese candles are smooth and pleasant to the touch. 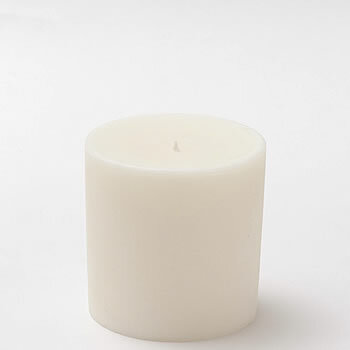 When handling the candles, customers often ask us what they are made of. 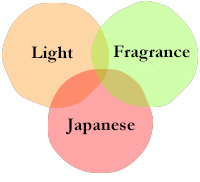 Below is a quick introduction to the materials used when making our Japanese candles. What is the wick of a Japanese candle made of? One difference between Japanese and Western candles is the wick. In general, the wick of a Japanese candle is made from washi paper, while the wick of a Western candle is made from thread. Japanese candle wicks are made by wrapping a stick in washi paper and then dipping the paper in wax. 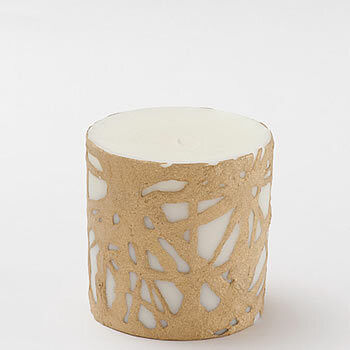 Since the paper is wrapped around a stick, the wick remains completely hollow, allowing air to pass through its center. This is why the flame of a Japanese candle will waver and flicker even when no wind is present, and results in a flame whose center burns brighter than that of a Western candle. 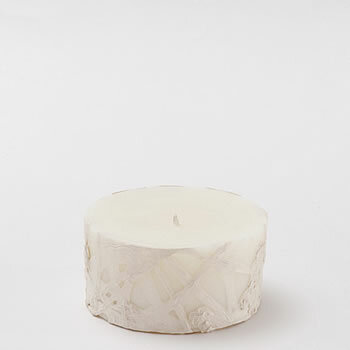 Wicks made of washi paper absorb wax well, which helps prevent dripping. For even better absorption, the washi paper is sometimes wrapped in tosumi, which is pith from the stems of common rush. 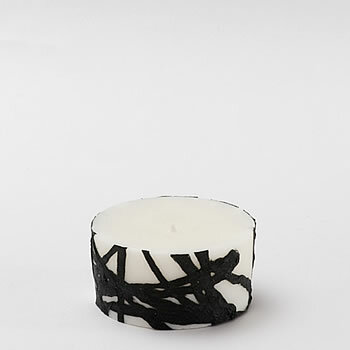 A wick made of washi paper and tosumi is thick with excellent absorption, and even more air can pass through the center which results in a larger and taller flame. What kind of wax is used to make Japanese candles? 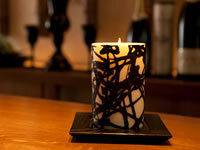 Japanese candles are made using a variety of waxes. These include plant-based fats and oils such as Japan wax, soy wax, and rice bran wax, in addition to beeswax, which is gathered from honeycombs. In the past, there was even a type of wax made from the fat of whales. 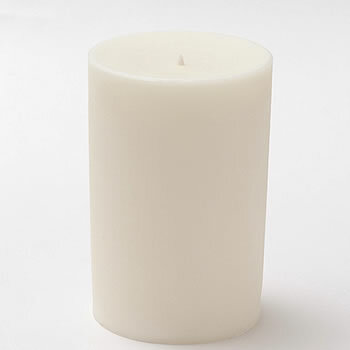 Western candles generally use paraffin wax, which is made from petroleum. 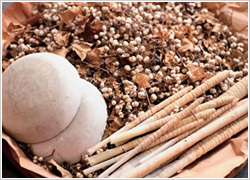 Japan wax is produced from fat extracted from the outer shells of Japan wax tree berries. At Kodaikokuya, we use a Japan wax called kokomi that is extracted from Japan wax tree berries that have been aged for 2 years. After the berries are harvested, the outer shells are dried and stored in a cool place for 2 years. The aged berries are then steamed and pressed before the fat is extracted. 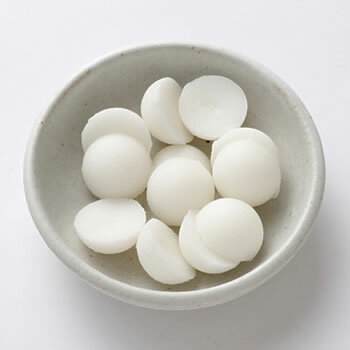 Once any impurities have been removed from this fat, the remaining product is Japan wax. 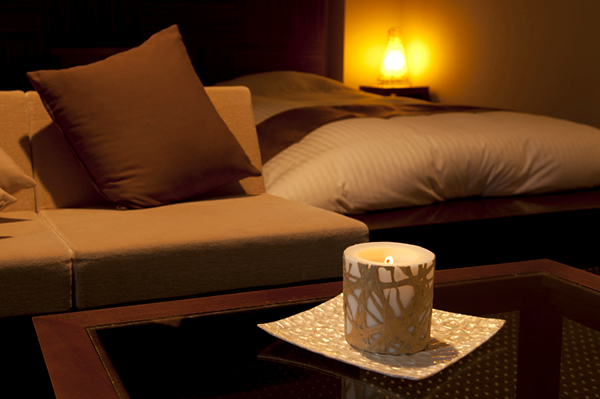 Because Japan wax is made from a plant-based fat, it has a low melting point and processing is considered difficult. 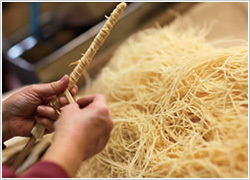 In fact, the processing techniques that we use are unique to Kodaikokuya. Our method of making Japanese candles using Japan wax and wooden molds is also unique, and it is rare to see other companies producing Japan wax products made using wooden molds. Below are a few of the products that we make and sell at Kodaikokuya. These include our own Japanese candles, incense sticks and powders, Buddhist altar products, and much more. With thousands of products to offer, we can’t list them all here, so feel free to contact us if you don’t see the item you are looking for. 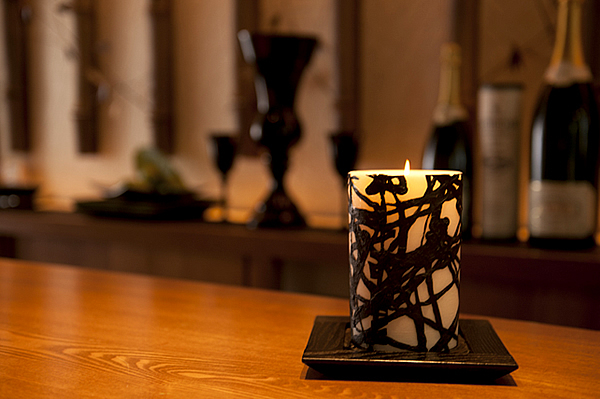 These candles are manufactured using a unique blend of materials formulated by Kodaikokuya. The spool shape, with its beautiful and gentle curves, has been used for traditional Japanese candles since long ago, while the conventional stick shape features straight lines but is slightly wider at the top. 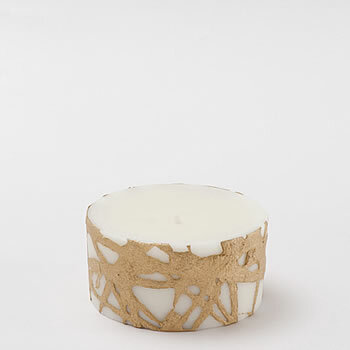 These candles are made using a material of the highest grade known as kokomi, which is made from Japan wax tree berries that have been aged for a period of two years. 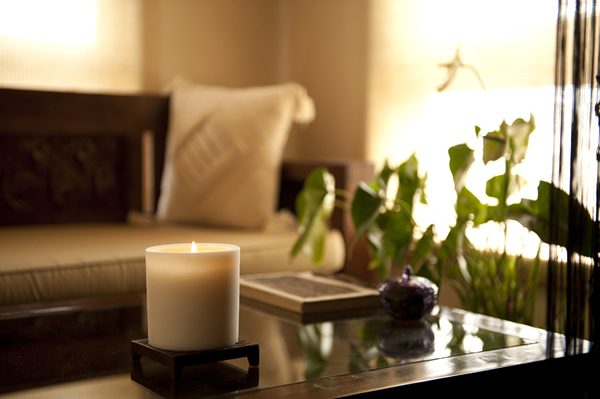 Pure Japan wax candles contain no additives or other materials. 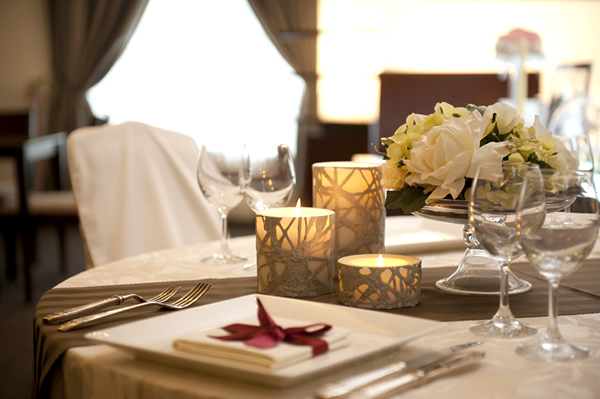 Gold candles are used at celebratory events, such as weddings and certain auspicious Buddhist ceremonies. 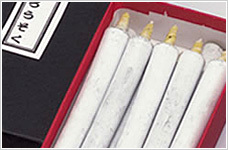 Silver candles are used at funerals and Buddhist memorial services. In some cases, red candles may be used in the place of gold candles, while unbleached candles may be used in the place of silver candles. In the past, it was often difficult to find flowers to be used as an offering at Buddhist altars during the snowy winters in northern Japan. 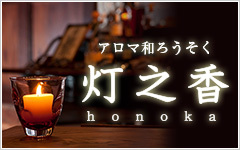 Flower-decorated candles, known as hana-rosoku, were created to fulfill this role. 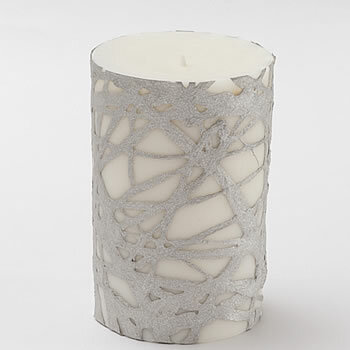 In more recent times, these candles are also popular as interior decorations and souvenirs. 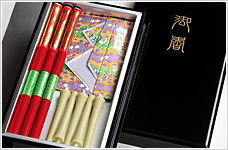 Incense, Japanese candle, and agarwood sets, items packaged in decorative gift boxes, and candles inscribed with Buddhist scriptures are also available. These items make great gifts when visiting family for the holidays and are well-suited as offerings for Buddhist altars. 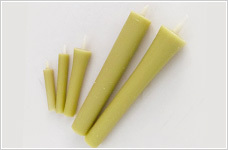 Unbleached candles can be used at ordinary religious services in addition to a wide variety of everyday situations. 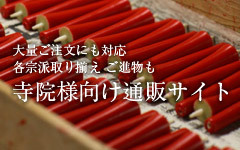 Red candles are used preferentially by the Jodo Shinshu sect of Buddhism at the New Year’s and fall Hoonko and other customary ceremonies. Aromatic Japanese candles perfect for the modern lifestyle Let traditional Japanese craftsmanship accent your living space with gently wavering flame and a hint of fragrance. While still honoring the traditional Japanese candle concept that has been passed down through the ages, we added an extra touch of style to create a candle fit for the modern lifestyle. In addition to an unscented option, the candles are available in two different fragrances inspired by nature and its flora. 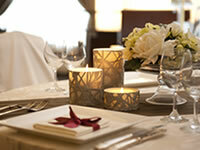 The fragrances are subtle, making the candles suitable for any setting, including the dinner table. Our Japanese candles decorated with the traditional Echizen washi paper of Fukui exude a sense of both elegance and drama, and are a gorgeous accent to any space-from the home to hotels and restaurants-regardless of decorative style. Borrowing from the traditional Japanese candle shape, these pillar candles are narrower at the bottom and grow slightly wider towards the top. The shape resembles the top half of a traditional Japanese candle. 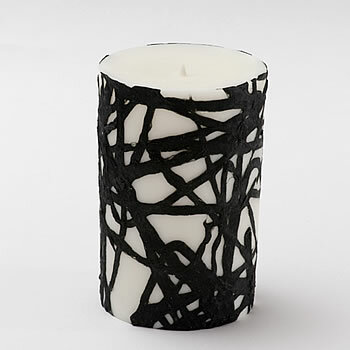 The candle wicks are made from washi paper. 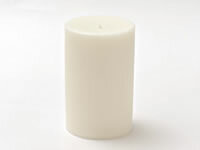 While the wicks of our candles meant for use in temples are relatively thick, the thickness of Honoka series wicks varies depending on the shape of the candle. 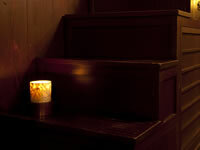 The candles have substantial heft, making them more stable and less likely to fall over. 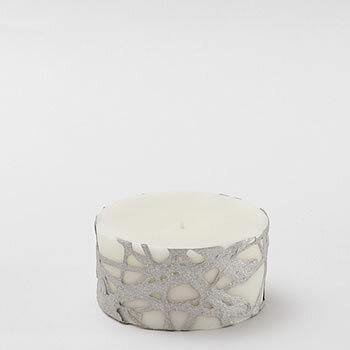 Only the inside area of the candle surrounding the wick melts, resulting in a soft, ambient light that you are sure to enjoy. Two fragrances are available. 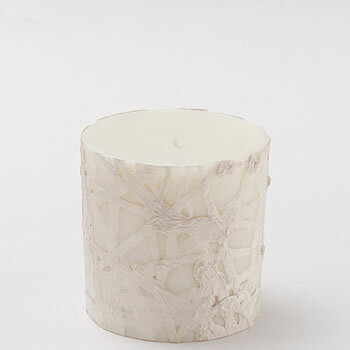 The first is inspired by the forest, which is the source of the materials used to create Japanese candles. The second is inspired by that scent of flowers that we have all encountered at some point in our lives. The forest-inspired Sou fragrance has a refreshing aroma based on Japanese cypress essential oil, while the floral Rin fragrance is based on the calming aroma of chamomile flowers. An unscented option is also available for use at the dinner table or any setting where a fragrance may be undesirable. The candles fit perfectly in a variety of smaller glasses and mug cups. 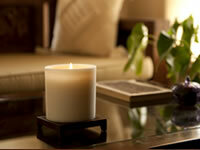 Place one in a candle holder or glass and enjoy the gently wavering flame and fragrance of our Japanese candles. Candles will burn for around 6 hours. 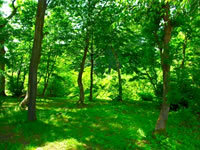 Burn time varies depending on temperature and other environmental factors. 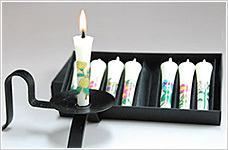 These Japanese pillar candles are decorated with traditional, handmade Echizen washi paper. Only the inner part of the candle surrounding the wick melts. The outer part of the candle remains intact. 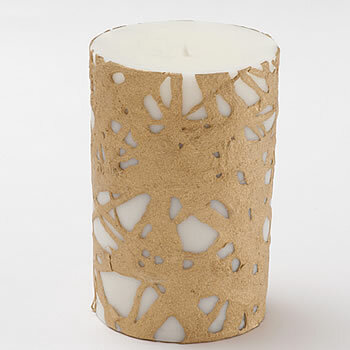 The soft glow of the flame escapes from between the edges of the washi paper, resulting in an ambience that changes over time as the candle burns. These fragrance chips are pieces of wax with aromas sealed away inside. 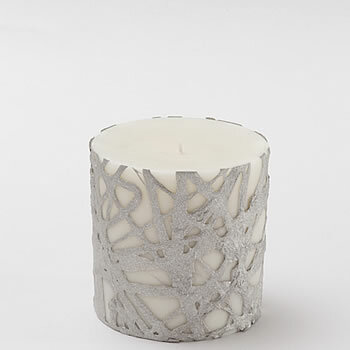 Add them to a candle that has almost been used up, or use them to mix and match fragrances. Enjoy your own special aromatic creation. They can even be used separately as an air freshener. 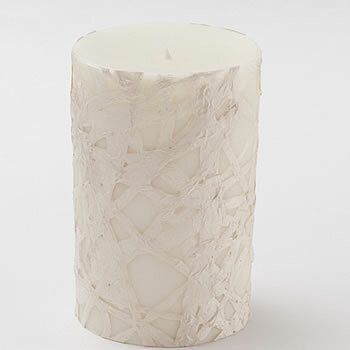 ・The washi paper used to decorate our pillar candles is handmade, making each design unique. ・All of our products are handmade. Please allow for up to approximately one month from time of order until delivery. ・Please note that large orders will require even more time to process. 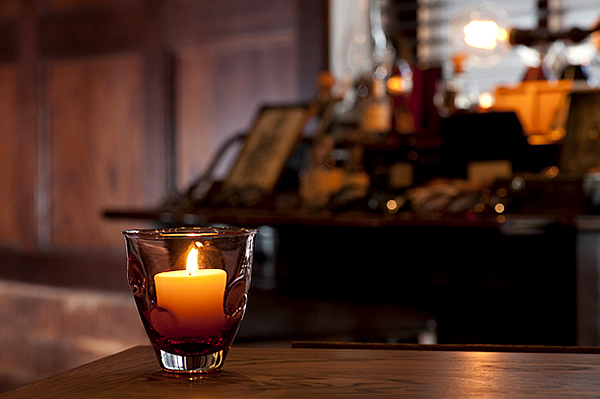 ・The outer surface of the candle may soften when the candle is lit. ・Do not pick up candles while they are lit. 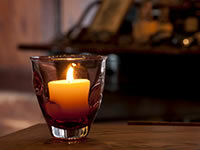 ・Placing a lit candle in a location with a steady flow of air in one direction may result in non-uniform melting. 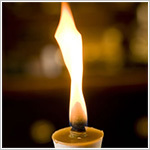 ・The size of the flame can be reduced by cutting the wick. If you wish to make a purchase, please contact one of our sales representatives via email or fax. Please include the name of your organization or establishment, a telephone number, address, point of contact, and a web site if one is available. One of our representatives will contact you once your inquiry has been received. ©2010-2019 kodaikokuya.co.jp All rights reserved.